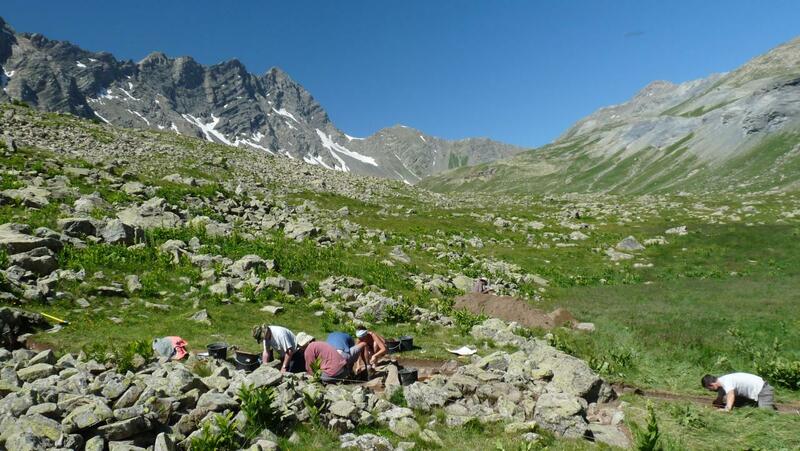 The 14-year study in the Parc National des Écrins in the southern Alps is one of the most detailed archaeological investigations carried out at high altitudes. It reveals a story of human occupation and activity in one of the world’s most challenging environments from the Mesolithic to the Post-Medieval period. The research, published in Quaternary International, was led by Dr Kevin Walsh, landscape archaeologist at the University of York in partnership with Florence Mocci of the Centre Camille Julian, CNRS, Aix-en-Provence. Dr Walsh explained: “High altitude landscapes of 2000 metres and above are considered remote and marginal. Many researchers had assumed that early societies showed little interest in these areas. This research shows that people, as well as climate, did have a role in shaping the Alpine landscape from as early as the Mesolithic period. This research shows that people, as well as climate, did have a role in shaping the Alpine landscape from as early as the Mesolithic period. Excavations carried out by the team showed human activity shaped the Alpine landscape through the Bronze, Iron, Roman and Medieval ages as people progressed from hunting to more managed agricultural systems including the movement of livestock to seasonal alpine pastures, known as transhumant-pastoralism. “The most interesting period is the Chalcolithic/Bronze Age when human activity, particularly to support pastoralism, really begins to dominate the landscape,” said Dr Walsh. “The Bronze Age buildings we studied revealed the clear development of seasonal pastoralism that appears to have been sustained over many centuries with new enclosures added and evidence of tree clearing to create new grazing land. The study also uncovered evidence of Stone Age hunting camps in often inhospitable conditions in the upper reaches of the Alpine tree line at 2000 metres and above. Other finds included a Neolithic flint arrow head at 2475 metres, thought to be the highest altitude arrowhead discovered in the Alps. Initial fieldwork for the project started in 1998 followed by a series of further fieldwork expeditions into some of the most remote and spectacular landscapes in the national park. “The nature of these landscapes and the fact that no-one had ever carried out fieldwork in these areas meant that we had to carry out numerous phases of work involving long treks over difficult ground and sometimes in challenging weather. “The result of this work is that only now do we have a clear understanding of how these remote, beautiful areas were exploited by people over the millennia,” said Dr Walsh.